Good day, everyone. It’s a busy week around here with unexpected travel and some work related chaos, but we’re back with a review. Today, let’s take a look at the recently released Ortega Serie D from Eddie Ortega/Ortega Cigar Company – specifically the Number 10 (6X52 Belicoso). The Serie D is the first offering from Eddie since leaving EO Brands (makers of 601, Cubao, and Murcielago) back in January. I have to admit I’ve smoked a number of the Serie D, and at least one in each of the five sizes, since their release just weeks ago. 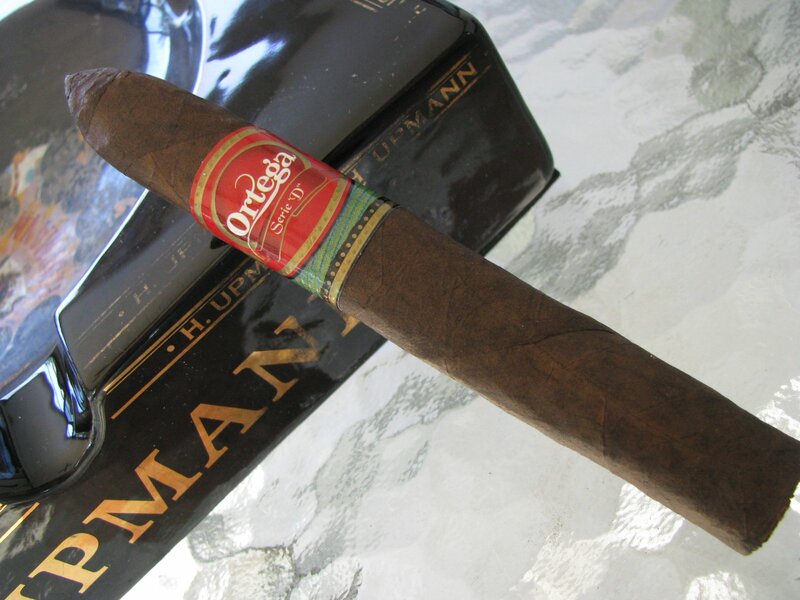 They are made for Ortega by Pepin Garcia (My Father Cigars S.A.), carry a Mexican San Andres wrapper, and Nicaraguan binder and filler. I began this review a couple of times with other vitolas (the Number 7 is actually my personal favorite), only to scrub the mission midway through because quite honestly I just wanted to enjoy the smoke. While review-writing is a fun diversion – otherwise I wouldn’t be spending my time fumbling through the process of learning how to do these things – it is sometimes good just to sit back and savor a cigar rather than busy yourself taking pictures and trying to keep notes in the process. I find myself just wanting to take in the moment and enjoy these sticks. So, on with the show! Before first light, the aroma on the foot strikes me as a fresh hay, or even molasses if you linger a bit longer. The wrapper aroma is similar, but more faint. The pre-light draw is earthy, with only the slightest bit of spice on the tongue. The construction is solid, with no noted voids or tight spots and a very good draw. I came across a rogue tweet or two early on in the initial release that mentioned some tightness in the draw, but none of the ones I’ve had presented any draw issues whatsoever. The wrapper has a slightly oily feel to it, but not really a visible sheen, and is a beautiful dark chocolate brown. It almost has a rustic appearance in that the wrapper telegraphs every nook, cranny, and bump beneath. The leaf veins can be seen, but barely felt. The room note while toasting the foot of the Serie D reminds me of toasted oats or nuts. I’ll mention here that this series has almost universally been extraordinarily easy to light. They have taken the flame evenly and quickly almost without fail. Going into the first inch of smoking, the smoke is somewhat drying on the palate. Not cloying by any means, just enough to pleasantly coat the inside of your mouth and keep your attention. I do get some mild red pepper this early on, and what I would call a woodsy core of flavors. The burn is well behaved, and as of yet is flawless in today’s stick. The second inch is where the #10 really comes into its own. It’s still somewhat dry on the palate, and keeps the early notes of toasted nuts – although the hints of wood come to the foreground for me. The wood flavor has sweetened a bit, and in keeping with my habit of drawing associations to my grilling/smoking escapades, this reminds me of when I have applewood in my smoker in preparation for smoking salmon. The sweetness is not pronounced as in an added flavoring, but produces that sensation of being sweet when tasted and smelled. The early indicators of a well constructed cigar are proving to be true, and the stick has kept its good burn and even-keeled draw. After the second inch, and going into the third, the burn has wandered slightly. Nothing significant, just some slight scalloping easily corrected with a quick touchup. It hangs on to the earlier oat flavors, with the addition of some leather, but still keeps the woodsy core. The apple-like sweetness I mentioned above is still there, but some additional sweetened has occurred – it actually reminds me a bit of allspice, albeit only in fleeting wisps. There are also some brighter notes of cedar on the retrohale. 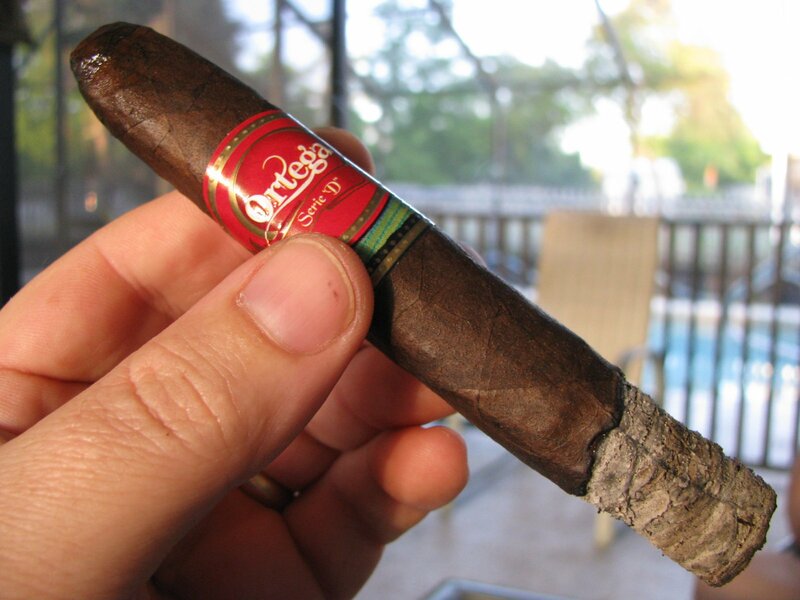 In the final stretch, I would place the Ortega Serie D well within the medium range for strength, but it produces bold, full and enjoyable flavors throughout. The only negative thing I can even concoct is that they can get a little “ashy” tasting if you overpuff them during the last couple of inches. But, that is avoided by simply minding your cadence. 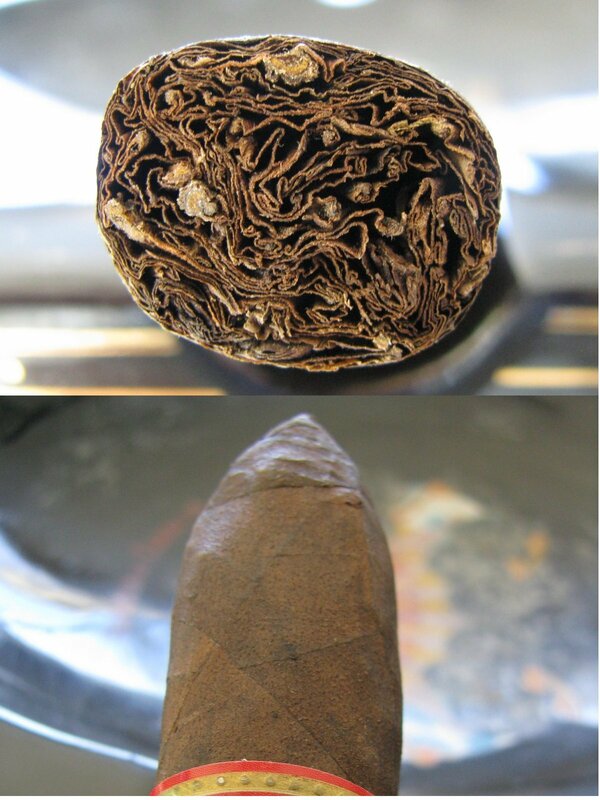 In my mind, these are great cigars in most every respect. They have the added bonus of being at a very reasonable pricepoint as well. My local shop has singles for $6.10-7.10 each, and if you buy in box quantities they can be had for $5.85-6.25 each. That’s a heck of a bargain in my book, and I plan on stocking up…plenty for now, and some to keep tabs on to see how they progress with added time in the humidor. I wouldn’t shy away from recommending the same to you. From what I have read so far, and your thoughts of this cigar, I may have to find one and smoke it. Thanks for the review. They’re great sticks, Swede. You definitely should check out that Number 7 corona. I am a big fan of blue label 601 and like this offering as well.